It’s been almost exactly one year since I first shared this Almond & Herb Crusted Baked Salmon recipe. Except back then I was still located at Empowered Kitchen using a blogspot dot com address because apparently I didn’t do a very good job scouting for a blog name that wasn’t already taken. Whoops! I was probably thinking more along the lines of – ‘I cannot spend another moment thinking up cheesy blog names so just get on with it already.’ Thus, A Saucy Kitchen was born. That all being said there are a lot of things that have changed this past year, but one thing that hasn’t is my love for this simple baked salmon recipe. I think it’s safe to say that I’ve made this salmon more than any other dinner recipe that I’ve shared on my blog because it’s just that good. And easy! When I say simple I’m not messing around. All you need is one baking sheet and less than 20 minutes start to finish. By the time 5 o’clock rolls around I’m just about done doing normal, productive human things and am ready to throw on a pair of leggings, take off my bra (TMI? Really though there is no greater feeling in life than that moment), and catch up on some shows. Although I say I’m done being a person by 5 o’clock. In reality work/life balance is non existent when you work from home. There’s no clocking out or winding down after a day in the office because you’re always switched on. Even more reason to want a meal that’s both fast and flavorful, I suppose. In essence this is the same recipe that I originally shared last year with a few minor tweaks. I also decided to make it more of a meal by throwing in some asparagus and maybe a little extra lemon zest. What is it about citrus and fish that makes our tastebuds sing? 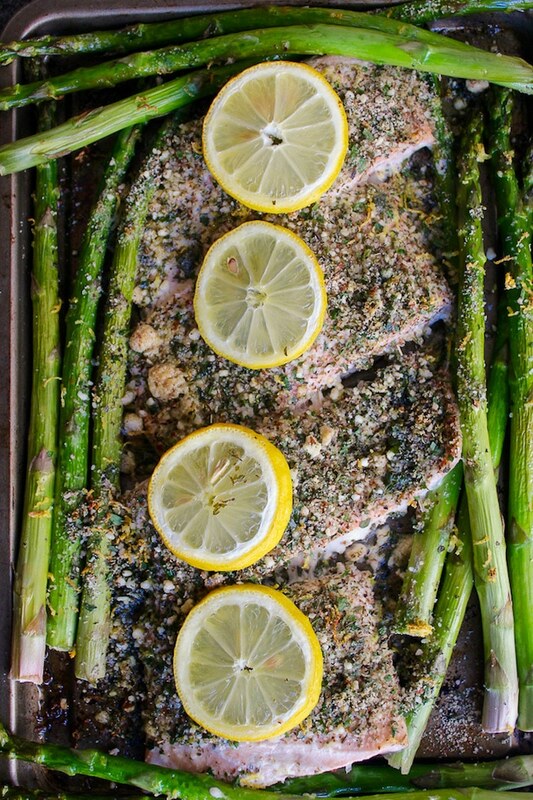 I hope you enjoy this almond & herb baked salmon as much as we do! Don’t forget to #asaucykitchen on instagram if you try this salmon. I love seeing what you make! You can also post your pictures to my facebook page! In a small bowl, mix together the ground almond, herbs, and the salt & pepper. Set aside for the moment. Spread the asparagus over a baking tray and drizzle the oil over the stalks. Sprinkle a pinch of sea salt and half of the lemon zest over the asparagus and toss to coat. 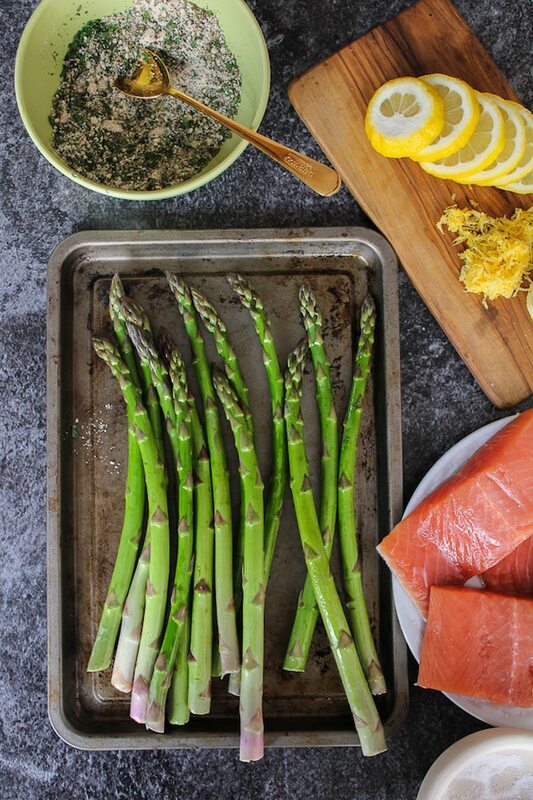 Push the asparagus to the sides of the baking tray to make room for the salmon. Lay the salmon fillets skin side down across the tray. Squeeze the lemon juice over the salmon pieces and then spoon the almond and herb mixture evenly over the fish. Top with the remaining lemon zest and lemon slices. Roast at 204C/400F for 10-12 minutes or until the fish is cooked through. This was so easy to make and super yummy! Will be making this many more times! Great recipe! Thank you for sharing it! I just smashed a bunch of almonds and it was totally fine. Mix of fresh herbs and dry herbs; I think the fresh herbs go a long way. Delicious!! This is exactly a dinner that I would make for my family! I love salmon and asparagus they just go so well together! I love that you included a video, it’s funny, I actually have the same flower shaped bowl that you mixed the spices/topping in! You had me at “one pan.” Always looking for healthy, quick dinners to throw together. And asparagus is all over our farmers markets right now. I love the idea of adding ground almonds and herbs to add all that flavor! Saving to try soon! Thanks Melissa – hope you guys like it! this is totally my kind of dinner! What a great mix of flavors! And of course, the ease and prep make it perfect for a weeknight! I think I’m done with adulthood by 10am, haha. Alas, five little people reminds me of my status far too late into the night. 😉 This dish sound wonderful, though! Thanks for sharing it at Savoring Saturdays! Thanks Kristy! Me too – I just love when there’s a little crunch to my food. Ob-ssessed! This looks awesome! Asparagus and Salmon are some of my absolute favorites 🙂 But about the almonds, do you grind them yourself or buy them like that? Can I use a food processor to grind them? Thanks!